Do you find it hard to concentrate on what you're doing? Is it impossible for you to schedule drinks with your friends because you have so much work to do? Do you struggle to put your thoughts into words? The problem might not just be with your mind, but with your desk. 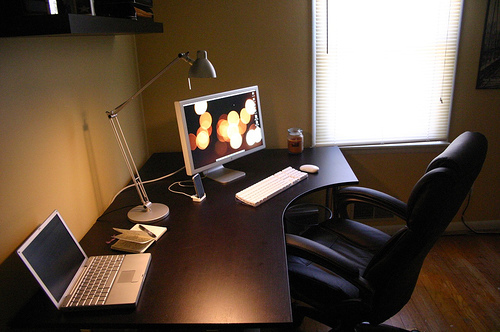 Go on, be honest - which one is the most like your work space? You know how it is- you sip on a nice cup of tea as you work, and you never get round to taking it to the sink. You have twenty different documents that you have to keep looking back at, and now they lie in a pile beside you. You have all those little bits and bobs that don't really belong anywhere, so you try to arrange them neatly near your computer. The result? An untidy mess that you are constantly looking at from the corner of your eye - which actually helps to make your mind just as messy. A clean, clear working space will result in a cleaner, clearer mind - if you don't believe me, just imagine yourself sitting at each of those desks in turn, ready to write your next essay, work on your taxes or update your website. Ugh - just looking at the mess on the second one makes my head hurt! 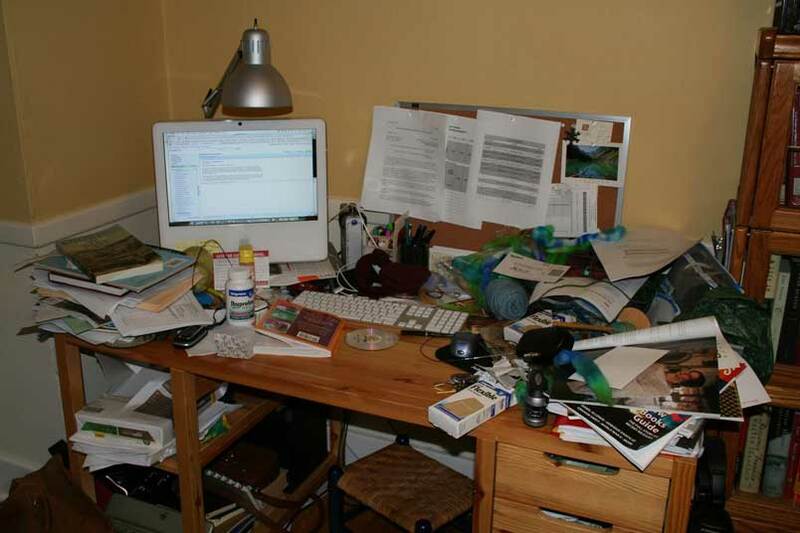 You might think that a disorganised desk is a sign of your disorganised mind, but the reverse can also be true. The trouble is that it's a vicious circle, and if you treat your desk this way then it's likely that your bedroom, wardrobe or even your purse is suffering from a similar state of neglect. Go on, take a look inside. How many old receipts can you find? I often catch myself with two or three in there, as well as random flyers or other assorted pieces of rubbish. Trust me, when you throw away the stuff you don't need and end up with something beautiful, organised and clean, it becomes SO much easier to organise the thoughts in your head. When you approach your work from a place that is visually pleasing, you'll find it so much easier to think clearly, to concentrate and to think of new ideas. It can seem daunting at first - especially if your desk is so messy that you have no idea of where to start - but if you start small, you'll find that there ain't no mountain (of paper) high enough to keep you from your maximum productive potential. If there's nowhere else to put that book or those pens, try adjusting everything so they're at square angles with each other. It can make everything look so much more tidy! In my new summer course - Summer School 2012 - I will help you to really look at the mess, whether it's your desk, kitchen or your schedule, and to sort out the things you want and need from the things that you keep around for less positive reasons (whatever those reasons might be - we'll look at them too). You can follow my simple step by step guide for ruthlessly de-cluttering any aspect of your life, and as it's a group project, you can inspire and encourage each other with your own before/after photos. If you're wondering about MY desk - well, here is my own before/after from today. Once you get into "cleaning mode", you realise just how much rubbish you've been keeping around. You wonder "hey, why has this sock been on the floor for the last two weeks?" or "Why did I never throw away the previous tenant's dead plant? ", and you FINALLY do something about it. Oh, and they say a plant on your desk boosts creativity, so I added my new buddy, the mint plant. Mmm, mojitos! Desks are also used in classrooms by teachers and professors. There are bare desks which are mainly used for keeping the material with which the teacher writes on the board. There is place to keep just enough books on them.